Although the price is low, it is not inferior to selling at a tool shop etc., and it can be used normally. This review is about item#8265162. 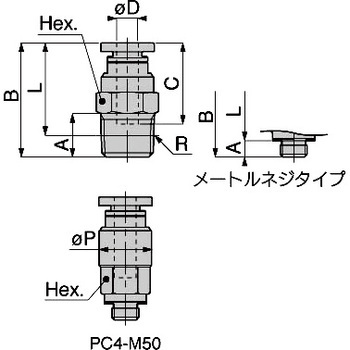 I purchased for connection to a regulator with the one of the pipe taper screw. There was a possibility that the hook at the time of round fitting inside was deformed and the tube was pulled out and air leaked, but it is all right with this product. This review is about item#9146767. I purchased it because it was not nearby. I think that it is a good product. This review is about item#9146803. This review is about item#8265144. I used it for the new place. Since it can be used as it is and it is a maker item, it was safe to use it. This review is about item#9146751. Well, it was an ordinary product that I imagined. Quick response, I appreciate it. This review is about item#8265205. Compared to other companies' products, it is expensive, but it is high quality accordingly. I have never had any trouble so far so I will continue to use it from now on. PISCO purchased for the first time, texture is also good, the number of choices has increased. Good products are cheaply obtained and satisfied. Because it is difficult to obtain nearby, it is useful. Particularly, since PISCO parts are not sold in the near field, it is not available unless you are mail-order sales. Although it is a personal opinion, since quality and workability are excellent products excelling the group, I think that it may be more popular. When I taught an acquaintance who worked for decades at a facility company, I was surprised that "There was such a terrible thing!" This review is about item#09146803. I can use it steadily. I do not know in the photograph, but the surface to be screwed was tapered. For this reason it was more convenient for filament feed of 3D printers. This review is about item#09146715. This review is about item#9146733. Since it is PISCO product, it has a sense of security. I think that it will be better if the price goes down as a matter of fact. This review is about item#8265187. A classic and safe product. I try to replenish every time I use it. This review is about item#8265196. I checked the leak by screwing it into the female screw joint of the swage lock with the application type sealant but it caused gas leakage. I tried it with an individual that I thought was an individual difference of the product, but eventually the leak did not stop and I handled a seal tape and coped. This review is about item#8265153. Connection with the tube is also smooth, and it is using it without particular problem. Higher than other companies, there is a feeling of cut off when removing. This review is about item#08265153. This review is about item#09146733. Whether Pisco's things are accurate or not, the feeling of detachment is higher than that of other companies. This review is about item#08265205. Remaining tube can be carried out surely while it is perfect. Although it is a little, it corresponds also to the rotation of the tube in the lateral direction and it can be said that it is very good for use in the head part of the 3D printer. This review is about item#09146706. It can be used to connect the gas hose of the giraffe beer server. This review is about item#08265162.